Joe and I have been meaning to hike Preikestolen since we first arrived in Stavanger so when a friend from home decided to visit and the weather looked promising, it seemed there was no better time. Preikestolen or Pulpit Rock is a massive cliff that towers over the Lysefjord and it is this region's most visited site. While only about 25 km from Stavanger, it is about an hours car & ferry ride to the base. Once at the base, it's a 3.8 km hike to the cliff. While it's not considered a very difficult hike in Norwegian standards, the terrain is challenging. 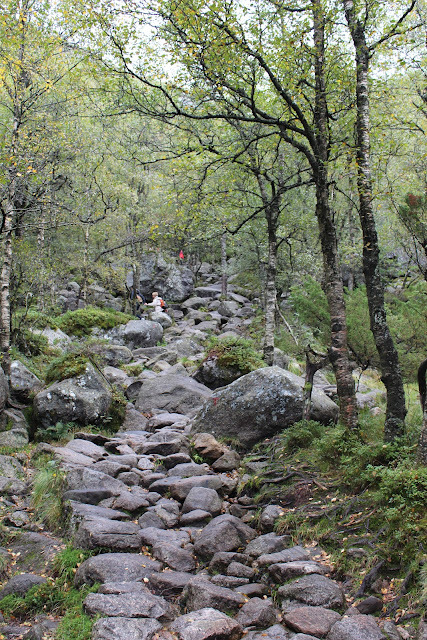 Rocks and boulders form the paths and at times, it's a fairly steep climb jumping from one slippery rock to another. After 1 hour and 45 minutes of solid hiking/climbing my legs were shaking and my stomach growling but when we rounded the last corner (which was hugging the cliffside and shuffling along a skinny ledge) we immediately knew it was worth it. The adrenaline rush having conquered the climb paired with the sheer beauty of everything around me had me in complete awe. It was one of those rare moments where you look around and think, "I can't believe I'm here. I can't believe this exists" and you can do nothing but stare in wonder. The below photos are completely unedited. That's me - looking down all 604 metres (1982) feet. In the words of our guest, "You know it's good when it's even better in person than it is in the professional photos." It looks amazing! Blown away by it and can't imagine how beautiful it must have been in real life. Not for the faint hearted though - I take it you are ok with heights? Wow, that looks amazing! 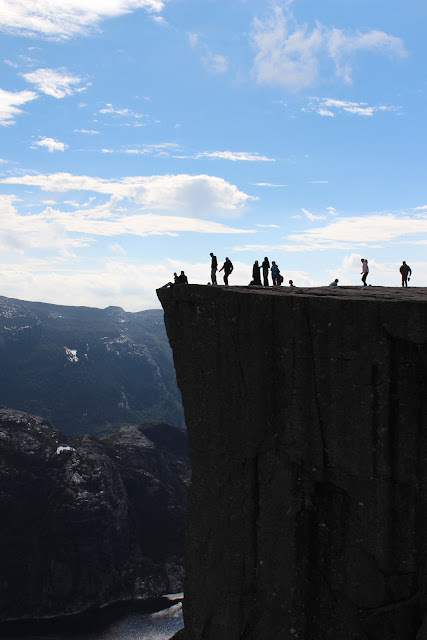 But I don't think I would ever have the guts to stand that close to the edge! breathtaking! the photos near the edge make me nervous - but I'd risk the height for those views. amazing story! just found your blog and i cannot wait to come back for more! i give you kudos for leaving your teaching job to follow your husband - and take a life on the side of adventure.i am very envious! also, i am a teacher-to-be. just graduated andlooking for a job, the market is so tough! thats why i admire your decision ever so much! Beautiful. I did a similar hike in Northern Nevada and now I'm itching for the next one. I would need some serious hiking shoes for what you did, though. I feel like hiking now. oh how lovely! what an amazing hike! Want to go there since forever! Such an amazing sight - and definitely worth the hike up and down!! Amazing! Wow, those views just look amazing. THAT looks incredible! I am so jealous! Wow what a view! Definitely worth the hike. No! That is my dream!! First of all to go to Norway, but to go right there! Right where you're standing/ sitting/ laying. So jealous. Wow! What a serene corner of the world. I can see why the work would be worth it. I love that last shot. Wow! Love this. I was Hoping to get here when I'm in Norway in March, However I'm pretty sure it is closed at that time of year... :( Means I have to go back though! I really want to go to Troltunga as well.. Maybe in a couple of years! Happy new year.